After a surfeit of runway fashion, it is refreshing indeed to return to the hallowed precincts of enduring, classic male style. Not for me, though, the Beau Brummells, the Robert de Montesquious, the Gilbert Osmonds and the more tarnished of dandydom; rather, the quiet, studied elegance – the painterly placement of the most appropriate detail – of a Jamesian hero: Hyacinth Robinson from The Princess Casamassima or Spencer Brydon from "The Jolly Corner." Or, for those of you allergic to Henry James, the Prince of Salina from Lampedusa's Il Gattopardo. Nevertheless, I am trying to explore the personal style of such a man. Everything about him is tailored, but with a nonchalance which makes him immune to mere vanity. The tone of his casual and formal dress is timeless, undiverted by the currents of trend. He is not a spendthrift. He looks and smells good. His hair is coiffed. His beard is trimmed. His shoes, while not of a military-grade shine, are cared-for. His suit fits. He sees no advantage in claiming membership in that band of men who deem personal style as prissy or unmanly. Short of those trifling excesses which come of a cultivated connoisseurship, he does not shoot his wad on designer fragrances and bags. He is not a label-whore. (Perhaps "label-rake" is more apt.) He uses common sense. He is not a braggart. He knows how to have a good time. En fin, he knows that there are superlative values in his being a man, in practicing the economies of masculinity. 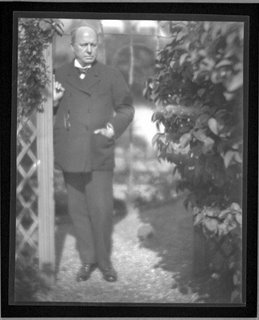 Image credit: Alvin Langdon Coburn, Henry James (in the garden at Lamb House, Rye). Courtesy of George Eastman House Still Photograph Archive.